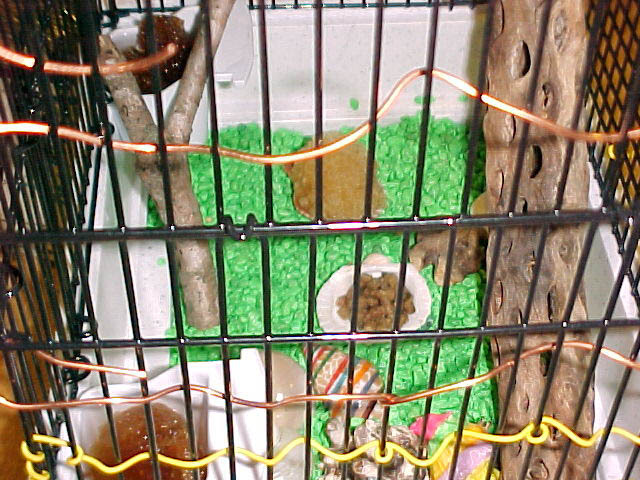 Two Hermit crabs came home as pets several weeks ago. And while hermit crabs for me aren't a new experience, I think this latest visitation will have an effect on the entire household. Considering we now have cats that have never before encountered things with pinchers that can pinch the noses and paws of the inquisitive, even Erin has long forgotten her previous set of twins, "Sebastion & Crusty" from when she was five. I have never forgotten for I am the caretaker of the crabs. My initial encounter with hermit crabs was when I was sixteen. I was old enough to date a little and on one foray into Ocean City I encountered the dime-store tourist shop that sold everything from OC coffee cups, slide whistles, squeaky crab toys, T-shirts, wooden displays, and well you name it, they sold it. They also had the best supply of hermit crabs in the area. I fell in love. I riveted my baby-blues, well almost blue—gray is close enough, on my 'then boyfriend' to buy me one. We didn't splurge for the habitat but just the crab, a slightly larger shell, and some food. I think it cost all of 8 bucks—which put a deep whole in his pocket. I pledged my little 16 year-old heart to that ugly little crustacean. He was little too. I couldn't stomach the larger versions. Home he came. I didn't have a clue to how hermit crabs behaved but they give you a paper that explains it all. The tiny 4"x6" cage they gave you he couldn't live in. He needed something larger. I didn't need to be told that he had a need to climb. Most do. If you ever stop at those gift shops those crabs are always at the top of the cages. They got there because they like to climb. Then I had an idea, it was more like an epiphany. Sixteen year-olds get them every ten minutes or so but don't often act on them. This time I did. I knew we had a bird cage in the house somewhere. It was up in the attic. When I located it I was ecstatic. Everyone in the house also knew I found it. They just couldn't figure out why I wanted it for my little crab. So with my little information sheet, I set about taking care of my new pet. I put sifted sand into the bottom of the birdcage, some shells, and a few sticks to climb on. I also embedded a very small glass dish of water into the bottom of the cage. I fed him with the food they provided along with other foods they advised. That dumb crab never ate anything normal, just mostly the crab food. It's a good thing he liked that stuff and didn't eat much. I didn't ever give the poor fellow a bath. The instructions never advised it. Sometimes I took him out for a wild run down the carpet and he enjoyed it. But mostly I just watched him and listened to him during the night. Actually, everyone in the house got to hear him during the night. That old birdcage was a gift of joy to that lonely little crab, no matter how I cooed to him, let him scurry across my hand and across the floor, he loved his cage. He climbed and he climbed. He sounded much like the pings of a submarine's sonar, ping, ping, ping, as he climbed up and down and around. Oh, and I have to tell you that old birdcage's wires were horizontal. That's important and we'll get back to that shortly. 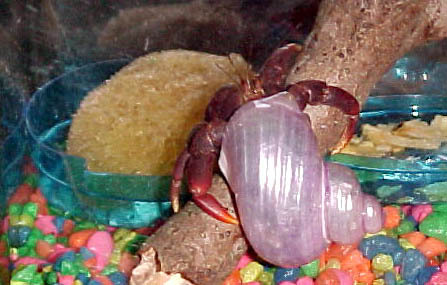 My little crab, duly dubbed "Crusty" from the movie, "The Incredible Mr. Limpet" lived for nearly 3 years. He would have lived much longer if I hadn't decided he was lonely and gotten him a companion. Hermit crabs actually are a chummy bunch but the new one killed my "Crusty." The second-one, who never lived long enough to be named, killed him. It broke my heart. I won't go into how the second one died. It was ugly. Long after I married and hadn't given a thought to a hermit crab in some time, my daughter, all of 5 decided on one of those infrequent trips to the ocean which is so close that she must have hermit crabs or simply perish, we did it again. This time we bought a pair. We also invested in a small hermit crab sanctuary with all the requirements. The dollar amount this time around was about $20. No big deal. Erin loved them for all of 20 minutes and I now had more pets to deal with along with the three cats and the dog. Now I was grown and knew more. The information fact sheet was more concise than it had been back in the day. Still, I gave them food. I talked to them, I exercised them, gave them baths, and so forth for almost two years before they hit the dust. I don't know what it was, but I think it was a lack of love and attention. Dutiful attention is not love. Without love all wither and perish. It think that's what happened that time. Now Erin's eleven. Last month we had another of our impromptu visits to the ocean. 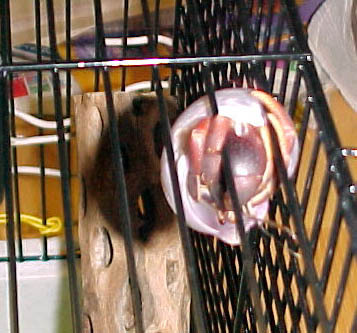 In March, hermit crabs are scarce for the dealers will tell you the often can't stand the cold in order to arrive home. There was a huge investigation. Finally we found a shop that had hermit crabs, they'd had 2 dozen delivered within the last two hours. After the fit my daughter had given me over the same last two hours, I was ready to either haul her home and lock her in a closet somewhere or pay my last dime for some hermit crabs. Lucky for her, we found the crabs. We bought two, along with a preserved starfish, a sand dollar, some good replacement shells, food, and a "sanctuary" for our new pets--dollar amount close to $30. This also didn't come with feeding shells but did come with one sponge. I wasn't happy. However we got a much better information sheet than I'd ever gotten before. It confirmed what I knew, the little buggers liked to climb. However their sanctuary was small without much to climb on and the sides were plastic. Where's to climb? I had an idea. Erin hated it. I wanted a birdcage again and a big piece of challa-wood that they love. If we were bringing home pets, this time we would have to do this right. They, now named "Crabby" and "Slowbro," suffered until Monday evening. I left work and rushed to the nearest pet store. And while they don't have much for hermit crabs, I found what I was looking for—a birdcage, the special wood and some food. They didn't have shells for nothin' but we already had a few. I bought feeding shells and more sponges for water. I was a very happy camper—right up until I realized what was wrong. They don't make birdcages with horizontal wires anymore. They make them vertically. It took me a whole 30 minutes after I came home to realize what the problem was. Now what to do? Well, the base of the cage also had a wire grid so I could turn that and attach it to the backside of the cage making squares so they could climb it. But what about the sides? I couldn't really do the front because of the feeding slides and the door. I wasn't worried too much about that, but I found some plastic-coated wire in the house and got busy with it. Within a few hours, my Crabby and Slowbro (not my choice of names—okay) could climb and feel more at home. Every night is bath-night in the sink. They get to play, listen to the radio and enjoy the light. They climb and play—and now the cats leave them well enough alone. Yes, the crabs have come home again and this time I was ready for them. If you take a hermit or hermit crabs for pets, be sure to allow them space to climb, good baths, plenty of food, and don't forget to lavish them with loving attention. Believe it or not, they do respond and they won't pinch you. Hermit crabs may not be for the squeamish, but they are funny to welcome home. If you're lucky you can watch them change shells. It's a gift to see for they are rather shy. Just remember to be a responsible pet owner. Crabs have feelings too—even the ugly ones.